April 3, 2017 by Thomas 6 Comments Richmond Savers has partnered with CardRatings for our coverage of credit card products. Richmond Savers and CardRatings may receive a commission from card issuers. 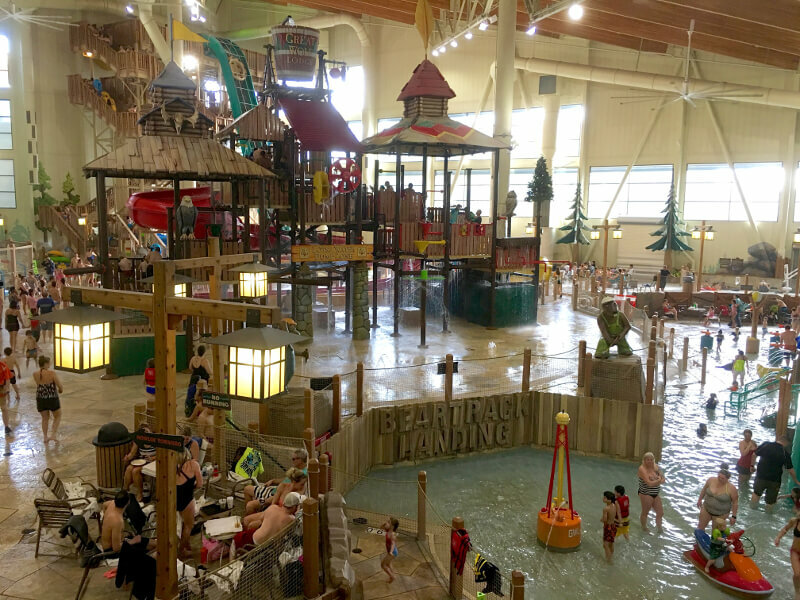 The Great Wolf Lodge is an awesome family destination! It’s perfect for just a weekend getaway, or as part of a spring break or summer vacation. Even winter is a fun time to go explore the indoor water parks, when playing outside might not be an option. One of my favorite things about the resort is that you don’t pay extra for waterpark access, and you get “two days of play with one night’s stay.” That means that on the day you check out of the hotel, you can still use the waterpark until it closes. But here’s the thing, going to Great Wolf Lodge doesn’t have to be an expensive trip. In fact, I’m going to show you how to go to the Great Wolf Lodge for nearly free! There are lots of tips online that show you how to save money here and there on the rooms, but I’m going to show you how to bring the total price to almost $0 using smart credit card rewards strategies. Imagine spending a weekend here with the family for free! This is a 100% proven strategy. We’ve used it to go to Walt Disney World for free, and we were excited to discover that it will work at Great Wolf Lodge too. This strategy is all about smart use of credit card rewards. I’m going to show you two credit cards that offer lucrative sign up bonuses, and then you can use those sign up bonuses to “erase” the costs associated with your Great Wolf Lodge tickets. If that sounds confusing, stick with me and I’ll explain more. Just remember: this should involve ZERO DEBT. You will pay off your credit cards in full. This strategy is only recommended for people who don’t carry a balance, because otherwise you’ll lose any “savings” by paying interest. The first step is to open the Capital One® Venture® Rewards Credit Card, which is one of the best travel rewards cards in the industry. Earn 50,000 Venture® miles after making $3,000 in purchases within the first 3 months of account opening. When you add the points you’ll earn on the minimum spend–that’s a total of 56,000 points, or $560 in travel statement credit. Use the Purchase Eraser® to offset “travel” expenses. Annual fee is the waived the first 12 months, then $95. One great perk about this card is that the travel expenses you later erase can be part of the original minimum spending. So, in other words, you could open this card and then almost immediately book your Great Wolf Lodge tickets. Then once you meet the full $3,000 minimum you could erase the ticket expenses! You can see why this is such a good card. You’ll only need to spend $3,000 on things you would normally buy like groceries, gas, etc.) and you’ll basically get $560 back! Not only that, but the points are incredibly flexible. Any travel expense can basically be “erased” with a travel statement credit from Capital One. Since your Great Wolf Lodge hotel room(s) are considered travel expenses, this works out perfectly. Pretty straightforward here…you’ll make your spending in the 3 months, then receive your points. Note: the costs of your GWL rooms CAN be part of your minimum spend if you can time it right. Or, you can earn the points first and then pay for the room. Now, you’ll simply book your rooms at the Great Wolf Lodge using your Capital One Venture as payment. This is straightforward and can be done online or over the phone. Once you’ve taken the trip, you’ll simply log in to online account and make your credit redemption. You’ll basically apply this credit to the charges on your account, meaning that you’ll no longer owe most, if not all, of them. Once this step is complete, you will have essentially erased your expenses! How cool is that? 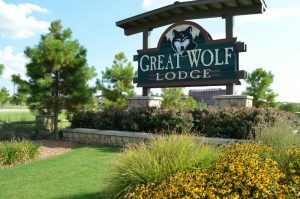 You might be familiar with travel rewards, but may never have thought to use them for the Great Wolf Lodge. Because you pay for access to the water park when you purchase your room, you don’t have to worry that somehow there is a “hotel” division of the resort and an “amusement” division that somehow bills differently and wouldn’t be coded as travel. I’ve confirmed with hotel staff directly that they bill under the category of “resorts/hotel.” The good news is that any charges to your room would also fall under that category, meaning you can potentially save on food and other on-site activities by using your points. Be sure to check out our detailed master list of ways to save at GWL, but we’ll discuss some of the easy wins below. Just because you are using points doesn’t mean that you still shouldn’t save as much money as possible. There are a few good tips to find cheap rooms at Great Wolf, which will help you afford a nicer suite, lengthen your stay, or save some points for another trip. 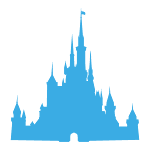 One important note: when you book rooms, whether on the GWL website or from a third party, make sure that the water park passes are included. For most standard bookings, this will not be an issue. But, I was told by a GWL rep that sometimes the special deals don’t include the waterpark price, so this is something to be aware of. One easy trick is to sign up on the Great Wolf Lodge website for alerts and offers. All you have to do is create an account, and they’ll send you news about upcoming specials. Discount offer on the GWL website. 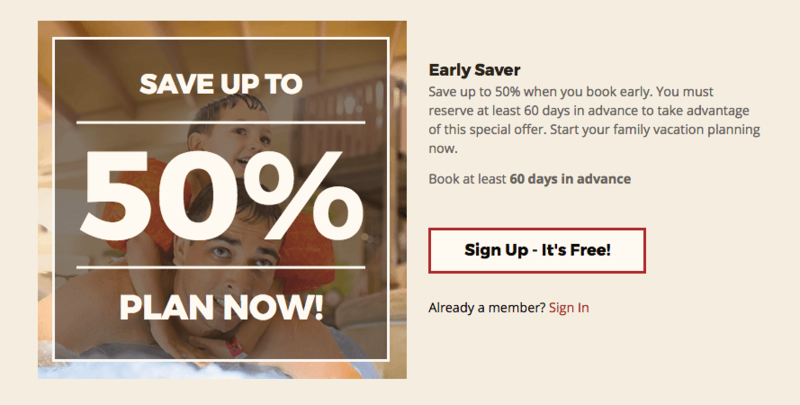 According the website, you can save up to 50% off by booking 60 days or more in advance. Combine that will an off-season booking and you can probably score some big savings. However, I still saw a lot of good deals in the summer, so you certainly don’t have to avoid peak season. 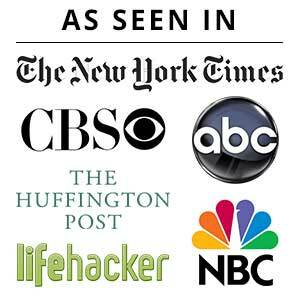 Some folks online have reported getting good deals from Orbitz, Expedia and other booking sites. Those discount sites will count as travel for the Capital One Venture, so feel free to use them if you can find a better deal. Just be careful with other discount sites, like Groupon, which likely won’t get you the travel credit. 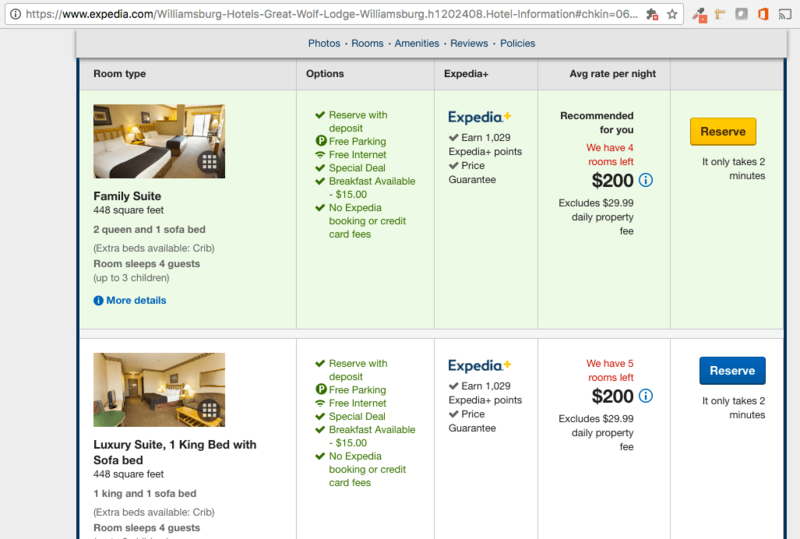 A sample of the deals you might find on third-party booking sites. It’s been reported that military members can get a discount of $40 or more by using the code: HEROES when booking. Large groups might also get promo codes from GWL for special events. I hope these tips help you take a fun and nearly free trip to Great Wolf Lodge! You can enjoy the slides, pools, hot tubs, and all the great activities on site without having to worry as much about the cost. Get started with the Capital One Venture. Have fun! Thanks for the vacation idea I’ve been looking for a good indoor water park in the area. We are using the heroes promo which also includes police & firefighters!!! Oh, Richmond Savers friends. Thank you for this post! This was just what I was looking for. Awesome! Hope it was helpful and if you go to GWL, have a fun trip! Can you pay any bill with thua card, like gas or groceries to earn points? 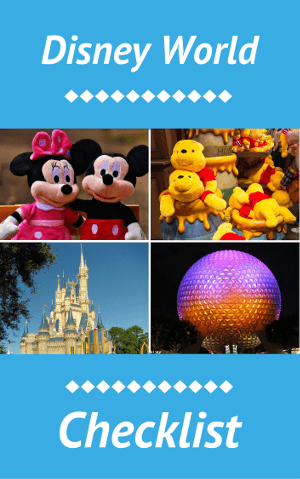 This guide contains everything you need to plan your FREE trip to Disney! Where dreams come true, but they don't have to cost a fortune!